For patient education resources, see the Blood and Lymphatic System Center, the Skin, Hair, and Nails Center, and the Pregnancy and Reproduction Center, as well as Anemia, Bruises, and Ectopic Pregnancy. The common pathway in life-threatening acute anemia is a sudden reduction in the oxygen-carrying capacity of the blood. Depending on the etiology, this may occur with or without reduction in the intravascular volume. It is generally accepted that an acute drop in hemoglobin to a level of 7-8 g/dL is symptomatic, whereas levels of 4-5 g/dL may be tolerated in chronic anemia, as the body is able to gradually replace the loss of intravascular volume. Blood loss is the most common cause of acute anemia seen in the emergency department (ED). Life-threatening causes include traumatic injury,  massive upper or lower gastrointestinal (GI) hemorrhage, ruptured ectopic pregnancy, ruptured aneurysm, and disseminated intravascular coagulation (DIC; see below). Sickle cell anemia is caused by a point mutation on the DNA of the beta-globin chain. Valine is substituted for glutamine in the sixth position of the amino acid sequence. In response to oxidative stress, hemoglobin S polymerizes, leading to sickling and hemolysis (see the image below). In mild sickle syndromes, the hemoglobin level is 9-11 g/dL. In more severe variants, the hemoglobin level is typically 6-8 g/dL. Patients with sickle cell anemia may have life-threatening complications during acute splenic sequestration and aplastic crisis. An aplastic crisis is due to cessation of erythropoiesis, which is caused by the human parvovirus B19 (see the image below). Although most adults have undergone autosplenectomy from repeated bouts of micro-occlusion in the spleen, young children can present with hemoglobin levels of 2 g/dL from sequestration of red blood cells (RBCs). If the patient survives the initial event, a recurrence rate of 40-50% can be expected. Thalassemias are characterized by decreased production of globin (alpha and beta) chains. Patients with thalassemia major (homozygous for beta thalassemia) develop severe anemia that requires transfusion in the first year of life. Other forms of thalassemia may cause acute anemia during periods of oxidative stress. Glucose-6-phosphate dehydrogenase (G6PD) deficiency and pyruvate kinase (PK) deficiency are the 2 most common enzyme defects that cause hemolytic anemia. G6PD deficiency affects the pentose phosphate pathway, and PK deficiency affects the glycolytic pathway. The 2 variants of G6PD deficiencies are African and Mediterranean. The Mediterranean variant has decreased enzyme activity in nearly all circulating RBCs. When cells are exposed to oxidant stress, a life-threatening hemolytic crisis ensues. In the African variant, only a limited portion of the RBC population is vulnerable at a given time; therefore, life-threatening complications are rare. Von Willebrand disease is the most common congenital bleeding disorder. The disease is characterized by deficient or defective von Willebrand factor (vWF), which is essential for platelet adhesion. Transmission is by an autosomal dominant pattern. Hemophilia A (classic hemophilia) is caused by factor VIII deficiency. Severe bleeding is common. Hemophilia B (Christmas disease) is due to a factor IX deficiency. The inherited forms of both hemophilia A and hemophilia B are X-linked recessive disorders, and thus occur almost exclusively in males. Autoimmune hemolytic anemia may be life threatening. The disorder is seen in association with autoimmune diseases (eg, lupus, certain types of lymphomas and leukemias), or it may be drug induced. In about 50% of cases, no identifiable etiology is found. Hemolysis is caused when immunoglobulin G (IgG) autoantibody binds to RBCs, which then lose part of the plasma membrane because of the interaction of the autoantibodies with macrophages. With loss of their plasma membrane, affected RBCs become spherocytes. Thrombotic thrombocytopenic purpura (TTP) is rare. Arteriolar lesions with localized platelet thrombi and fibrin deposits lead to thrombocytopenia and hemolytic anemia. The tissue hypoxia from occlusion of the vessels in the affected organ causes the symptoms of TTP. However, the cause of the occlusion remains unknown. Microangiopathic hemolytic anemia, thrombocytopenia, normal coagulation test results, and renal and neurologic abnormalities should lead the physician to the diagnosis. Immune thrombocytopenic purpura (ITP) is an autoimmune disease often precipitated by viral infections. IgG autoantibodies bind to platelets, which then undergo destruction in the spleen. The platelet count may fall as low as 10,000/µL, leading to bleeding. Acute anemia from hemolytic-uremic syndrome (HUS) is characterized by microangiopathic hemolytic anemia, thrombocytopenia, and renal failure. The disorder is similar to TTP, but arteriolar lesions are limited to the kidney. In children, the disease is sometimes seen after diarrheal illness caused by Escherichia coli, Shigella and Salmonella species, or viral gastroenteritis. In adults, it may be precipitated by estrogen use or pregnancy. Uremia may also lead to bleeding as a consequence of abnormal platelet function. DIC can be caused by systemic infection, massive transfusions, severe head injury, trauma, thermal injury, septic abortion, retained products of conception, or cancer. It initially causes thrombosis due to excess release of thrombin; this is followed by bleeding due to consumption of coagulation factors. Elicit a thorough and focused history while assessing the ABCs (Airway, Breathing, Circulation) and initiating resuscitation. In the critically ill patient, the emergency physician should attempt to obtain a focused history per the mnemonic AMPLE (Allergies; Medications, including over-the-counter drugs such as nonsteroidal anti-inflammatory drugs [NSAIDs]; Past medical and surgical history; Last meal; and Events preceding incident). With noncommunicative patients, information should be sought from caretakers, paramedics, or primary care physicians. For injured patients, paramedics should be questioned about the circumstances of the accident, mechanism of the injury, initial vital signs, estimated blood loss in the field, prehospital treatment initiated, and response. Patients with chronic illnesses are often knowledgeable about their condition and can provide information about prior complications and treatments. A call to the primary care physician may provide additional information and may help with disposition. Important specific queries should address gastrointestinal (GI) and menstrual histories (where applicable). Specific questions about menstrual timing, frequency, and duration of vaginal bleeding in premenopausal females are required. Denial of the possibility of pregnancy should not preclude a beta-human chorionic gonadotropin (β-hCG) test in premenopausal females with acute anemia. When concern for GI hemorrhage exists, obtain a full GI history, including stool color, consistency, and frequency. Black, tarry, malodorous, and frequent stools characterize upper GI bleeding proximal to the ligament of Treitz. Maroon, lumpy, irregular stools characterize lower GI bleeding. Consider constitutional symptoms of chronic illnesses (eg, weight loss, night sweats, rashes, bowel changes). Consider family history of malignancy or hematologic problems. Monitor initial vital signs and address any abnormality. Periodic measurement of vital signs and examinations of appropriate organ systems (eg, skin, nervous system, cardiovascular system, respiratory tract, and genitourinary tract) are helpful in assessing ongoing hemorrhage. In patients with multiple trauma, presume that every body cavity contains blood until investigation suggests otherwise. The chest, abdomen, pelvis, and extremities must undergo thorough physical examination with imaging, as clinically indicated. 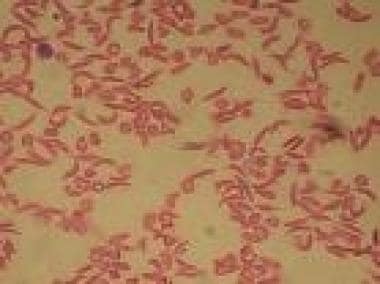 In early hemorrhagic shock, capillary refill time may increase and the skin may feel cool to the touch. With progressive shock, the skin is cold to the touch, and it appears pale and mottled. Flank ecchymosis (Grey-Turner sign) suggests retroperitoneal hemorrhage, whereas umbilical ecchymosis (Cullen sign) suggests intraperitoneal or retroperitoneal bleeding. Both are rare findings in acute states. Patients with jaundice may have liver disease, hemoglobinopathies, or other forms of hemolysis. Purpura and petechiae suggest platelet disorders, and hemarthrosis may be due to hemophilia. Diffuse bleeding from intravenous (IV) sites and mucous membranes may be due to disseminated intravascular coagulation (DIC). Patients with alcoholic liver disease may have spider angiomata, caput medusae, umbilical hernias, and hemorrhoids. Acute blood loss may result in agitation. When blood loss exceeds 40% of total volume, the patient may lose consciousness. With chronic anemia, the patient may have a hyperdynamic heart, with a prominent point of maximal impulse (PMI), a systolic flow murmur, and occasionally an S3. Advanced trauma life support classifies shock into 4 levels; particular findings are associated with each level, as follows. Class I (<15% blood loss) – Mild tachycardia may be present, but blood pressure is normal. Class II (15-30% blood loss) – Tachycardia, tachypnea, and a decreased pulse pressure are seen. Class III (30-40% blood loss) always leads to a measurable decrease in blood pressure as well as significant tachycardia and a narrow pulse pressure. Class IV (≥40% blood loss) leads to patient demise unless prompt resuscitative measures are taken. Marked tachycardia and significantly decreased blood pressure are common findings. Blood loss greater than 50% leads to loss of pulse and blood pressure. Urinary output is decreased in class III shock and is negligible in class IV shock. Patients with exacerbations of chronic anemia occasionally may present with signs and symptoms of congestive heart failure. Organomegaly is a common finding in patients with chronic blood disorders. A palpable spleen and an enlarged hepatic inferior border (more than 3 cm below the right midclavicular costal margin) may suggest chronic anemia. Once anemia is suspected, additional laboratory studies can be used to determine acuity and etiology. Send a blood bank sample so that type-specific or typed and cross-matched blood can be readied if necessary. Hemoglobin and hematocrit values are the initial laboratory studies. Pregnancy may lower the hematocrit level because of an expanded plasma volume. An acutely bleeding patient may have a normal initial hematocrit level; therefore, in this clinical setting, serial hematocrit levels must be measured. The studies listed below may or may not be useful, depending on the clinical presentation. Microcytic anemias (usually defined as MCV < 80 fL) include anemias of chronic disease, iron deficiency, lead poisoning, and the hemoglobinopathies (ie, sickle cell disease, sideroblastic anemia, thalassemias). Normocytic anemias (MCV 80-100 fL) include anemias of acute blood loss, hemolysis, uremia, and cancer. Patients with early forms of microcytic anemia and multifactorial anemia may have normocytic MCVs. 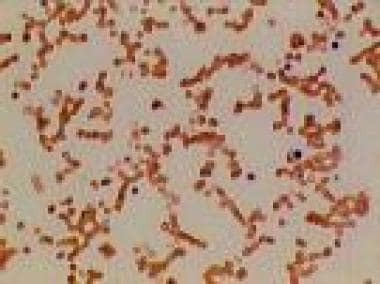 Macrocytic anemias (usually defined as MCV >100 fL) include anemias related to alcoholism, folate and vitamin B-12 deficiencies (pernicious anemia), and some preleukemic conditions. Helmet cells and schistocytes are found in microangiopathic hemolysis (eg, thrombotic thrombocytopenic purpura [TTP], immune thrombocytopenic purpura [ITP], hemolytic-uremic syndrome [HUS], and disseminated intravascular coagulation [DIC]). Sickle-shaped cells and Howell-Jolly bodies are found in sickle cell disease. Red blood cell (RBC) fragments may be found in patients with traumatic valvular hemolysis. Spherocytes are found not only in hereditary spherocytosis but also in autoimmune hemolytic anemias (eg, ITP). Spur cells may be found in patients with underlying cirrhosis. In megaloblastic anemia, the blood smear may show anisocytosis and poikilocytosis along with macroovalocytes (large oval hemoglobinated erythrocytes). Basophilic stippling and occasional nucleated RBCs may be present. The indirect or unconjugated form of bilirubin becomes elevated in patients with intravascular hemolysis. Because of digested blood, an elevated blood urea nitrogen (BUN) level is common in patients with upper gastrointestinal (GI) bleeding. The reticulocyte count may suggest an inadequate bone marrow response to anemia, which can occur in patients with aplastic anemia or hematologic cancers or can be due to drugs or toxins. For patients with hemolytic anemias, use a Finch reticulocyte count, which corrects for the anemia and the 2-day lifespan (versus 1-d lifespan, typically) of immature reticulocytes. The Finch count is the measured reticulocyte count multiplied by the measured hematocrit level, divided by 45, and then divided by 2. A simple corrected reticulocyte count is sufficient in patients with sickle cell disease. This is the measured reticulocyte count multiplied by the measured hematocrit level, divided by 45. Normal reticulocyte counts are 0.5-1%. Screening for DIC consists of prothrombin time (PT), activated partial thromboplastin time (aPTT), fibrinogen, fibrin split products, and platelets. Classic findings are elevated coagulation times, decreased platelets and fibrinogen, and the presence of fibrin split products. DIC must be considered in patients with profound sepsis, obstetric complications, burns, or cancer. Also, DIC screening should be considered when hemorrhage is difficult to control. Arterial blood gas (ABG) measurement is an excellent, simple, bedside study that can give a wealth of information about a patient’s oxygenation and acid-base status as well as the hemoglobin level. Urinalysis should be performed; hemoglobinuria or urobilinogen could indicate hemolysis. Urinary beta human chorionic gonadotropin (β-hCG) should be measured in premenopausal women with anemia. Serum iron testing measures the amount of iron bound to transferrin. The reference range is 50-150 µg/dL. The serum ferritin level effectively measures the total iron levels in the body. In adult males, the level is 50-150 µg/L. In adult females, the level is 15-50 µg/L. Transferrin iron-binding capacity (TIBC) is a measure of the total binding capacity of transferrin. Normal level is 300-360 µg/dL. The percent saturation of transferrin is the serum iron/TIBC. The reference range is 30-50%. Patients with iron deficiency have levels below 20%, whereas patients with iron overload have levels higher than 50%. Significant macrocytosis (MCV >100) suggests the presence of megaloblastic anemia. Most megaloblastic anemias are due to deficiency of cobalamin (vitamin B-12) or folic acid. Common causes include inadequate intake, inadequate production of intrinsic factor (ie, cobalamin deficiency), tropical sprue, parasites (eg, fish tapeworm), and drugs. Anemia associated with lead poisoning is usually normocytic and normochromic. It may be accompanied by basophilic stippling. Symptomatic lead poisoning is seen in children when blood levels are in the 80 µg/dL range. Children may present with abdominal pain, lethargy, anorexia, and pallor (from anemia). Ataxia, speech difficulties, seizures, and coma may occur in some patients. Consider hemoglobin electrophoresis if sickling appears or if the patient is of Mediterranean or African descent. Factor deficiency tests are required to diagnose hemophilia. Bleeding time is a useful test measuring platelet function. Patients with bleeding time longer than 10 minutes have an increased risk of bleeding. This test should always be correlated with normally functioning platelet levels, but very low platelet counts can prolong the bleeding time. Bone marrow aspiration should be considered when bone marrow reticulocyte response to the anemia is poor. The Coombs test can help diagnose autoimmune hemolysis. A direct Coombs test determines the ability of anti-IgG antisera to agglutinate the patient’s RBCs. In the indirect Coombs test, the patient’s serum is incubated with normal red cells, and IgG antibody is detected with anti-IgG. Ultrasonography is a quick, noninvasive, and relatively simple bedside test useful for diagnosing intraperitoneal bleeding. The focused abdominal sonography for trauma (FAST) examination is commonly performed to diagnose intra-abdominal hemorrhage in unstable trauma patients. When performed by experienced providers, the FAST examination is very helpful in detecting blood in the Morison pouch, paracolic gutters, splenorenal area, and the pelvis. It is also useful for detecting pregnancy-related bleeding. In pregnant females with suspected ectopic pregnancy, correlate the sonogram with the serum beta human chorionic gonadotropin (β-hCG) level. It is important to remember that most ectopic pregnancies present 5-8 weeks after the last normal menses. Transvaginal ultrasonography (TVUS) is useful if the fetal age is greater than 5 weeks; at earlier ages, a gestation sac is not visible. The serum β-hCG corresponding to this period is 1200-2000 mIU/mL. Therefore, a patient with serum β-hCG exceeding the 1200-2000 mIU/mL range who has an empty uterus as established by TVUS has an ectopic pregnancy and needs emergent laparoscopy if clinically indicated. Conversely, if transabdominal ultrasonography is used, a gestational sac should be visible by 6 weeks and the serum β-hCG should be greater than 6000-6500 mIU/mL. In this case, an empty uterus determined by transabdominal ultrasonography and a serum β-hCG greater than 6000-6500 mIU/mL indicates an ectopic pregnancy. Consider chest radiography in patients with significant anemia. Those with chronic anemia frequently have radiographic cardiomyopathy. In patients with trauma hemothorax, pulmonary contusions or evidence of great vessel injury (aortic rupture) may be evident. Look for free air under the diaphragm in a patient with suspected upper gastrointestinal (GI) bleeding, especially in association with an ulcer that has perforated. In patients with multiple traumas, as clinically indicated, obtain skeletal films, including a pelvic view, to diagnose fractures and the associated sequestration of blood at the fracture site. Mesenteric angiography is useful for diagnosing and treating hemorrhage from diverticula. Consider abdominal computed tomography (CT) scanning in all stable patients with significant abdominal trauma. CT scanning has sensitivity similar to that of ultrasonography and diagnostic peritoneal lavage (DPL) for diagnosis of significant intraperitoneal bleeding, and CT scans identify etiology better. CT scanning is also superior to DPL and ultrasonography for diagnosing retroperitoneal, pelvic, and subcapsular injuries. Tagged red blood cell (RBC) studies may be useful in cases of gastrointestinal (GI) hemorrhage without an identified source. Electrocardiography (ECG) is recommended for patients older than 40 years, for those with chest pain, for all patients with profound anemia, and for those with other underlying disease or increased risk factors for cardiac ischemia. Nasogastric tube aspiration is the initial test of choice in the emergency department (ED) to diagnose an ongoing upper GI hemorrhage. Bile must be aspirated to rule out bleeding proximal to the ligament of Treitz. Perform thoracostomy tube drainage in patients with trauma who have a hemothorax. Esophagogastroduodenoscopy (EGD) is the study of choice for the specific diagnosis of an acute upper GI bleed. Sigmoidoscopy or colonoscopy may be useful in diagnosing and treating lower GI bleeds, but it is rarely useful in the acute setting. Tagged RBC studies or angiography may be more useful for the localization of massive ongoing lower GI bleeding. Diagnostic peritoneal lavage (DPL) has been supplanted by ultrasonography and computed tomography (CT) and is rarely indicated. Culdocentesis is rarely indicated but may have a role in some situations. Perform this test for a pregnant patient with acute anemia and hemodynamic instability when pelvic ultrasonography is not available. Bleeding from an ectopic pregnancy appears as nonclotting blood. False-positive results may occur with a ruptured hemorrhagic cyst. A dry tap does not rule out ruptured ectopic pregnancy. Initial care of patients includes supplemental oxygen, intravenous (IV) fluid resuscitation, applying direct pressure to any external hemorrhage, fracture splinting, and rapid transport. Although recent prehospital studies suggest that trauma patients should receive minimal fluid resuscitation, this view remains unproven and controversial. The military antishock treatment (MAST) suit is occasionally used in the prehospital setting for trauma patients with pelvis and lower extremity injuries. It is contraindicated in patients with pulmonary edema or a ruptured diaphragm. It is also contraindicated in pregnant patients. Therapeutic approaches to anemia include blood and blood products, immunotherapies, hormonal/nutritional therapies, and adjunctive therapies. The goal of therapy in acute anemia is to restore the hemodynamics of the vascular system and to replace lost red blood cells (RBCs). To achieve this, the practitioner may use blood transfusions, vasopressors, histamine (H2) antagonists, and glucocorticosteroids, as well as mineral and vitamin supplements. Correction of acute anemia often requires blood, blood products, or both. With significant ongoing hemorrhage or hemolysis, transfusion of blood alone is insufficient, but providing timely transfusion to restore hemoglobin to safe levels can prevent major complications of acute anemia. Whole blood contains RBCs, platelets, and coagulation factors; however, it is rarely used as a treatment option. Packed red blood cells (PRBCs) are the remaining components of whole blood after the plasma and platelets are removed. One unit of PRBCs is the product of 1 unit of whole blood and has a volume of 250-300 mL. Each unit of PRBCs is expected to raise the hematocrit by 3 points. Each unit of platelets contains 50 mL of plasma and has normal amounts of fibrinogen and coagulation factors. Some decrease in factors V and VII is noted in comparison with whole blood. Each unit of platelets raises the platelet count by approximately 10,000/µL. The usual adult dose is 1 U/10 kg. Fresh frozen plasma (FFP) is the medium that suspends RBCs and platelets and contains all the coagulation factors. The coagulation factors are diluted. Patients with factor V and XI deficiency and those with coagulopathies due to liver disease are the best candidates for FFP administration; most of the other coagulation factors are now available in concentrated forms. Cryoprecipitate is derived from the precipitate collected from thawed FFP. It contains fibrinogen, factor VIII, von Willebrand factor (vWF), and factor XIII. It is ideal for treatment of mild hemophilia A and conditions that lead to afibrinogenemia. Vasopressors decrease portal circulation pressure by diminishing blood flow due to vasoconstriction. The major indication for these agents is variceal bleeding. Gastric acid inhibitors (eg, H2-receptor antagonists) are of limited benefit for actively bleeding patients. They are effective in promoting the healing of gastric and duodenal ulcers and in preventing their recurrence. Some controversial evidence exists about the utility of proton pump inhibitors (PPIs) in preventing recurrent acute bleeding from ulcers. Glucocorticoids (eg, prednisone) are used to treat idiopathic and acquired autoimmune hemolytic anemias. Vitamin K deficiency causes elevation of the prothrombin time (PT) and is commonly seen in patients with liver disease. Vitamin K may be used to correct prolonged PT and factors VII, IX, and X in patients with mild-to-moderate liver dysfunction who are not bleeding. The preferred route of administration is subcutaneous. Intravenous administration of vitamin K should be avoided, as rapid infusions can cause dyspnea, chest pain, and even death. Propranolol and isosorbide dinitrate are used in combination to decrease the incidence of bleeding in some groups of patients with esophageal varices. This combination is not useful with acute bleeding. In the emergency department (ED), the first steps are to evaluate the ABCs (Airway, Breathing, and Circulation) and to treat any life-threatening conditions immediately. Crystalloid is the initial fluid of choice. Transfer may be considered for patients who are hemodynamically and neurologically stable or when a higher level of care is required. The benefits of transfer must outweigh the risks. Patients with ongoing hemorrhage or ongoing hemolysis are unstable and should not be transferred unless the initial facility cannot adequately care for the patient. If unstable patients must be transferred, obtain specialty consultation and initiate all available recommended initial therapy. Specific management varies, depending on the etiology of the acute anemia and the patient’s condition. Monitor with pulse oximetry, cardiac monitor, and a sphygmomanometer. Provide supplemental oxygen via nasal cannula or face mask. Establish 2 large-bore intravenous (IV) lines, and rapidly infuse 1-2 L of crystalloid while monitoring the patient carefully for signs and symptoms of iatrogenic congestive heart failure. Consider type O or type-specific blood transfusion for patients who remain hypotensive after 2 L of crystalloid infusion; this applies to young healthy patients with a hematocrit below 20% and elderly patients with a hematocrit below 30%. Vasopressors are relatively contraindicated in the treatment of hypovolemic shock. Obtain fresh frozen plasma (FFP), coagulation factors, and platelets, if indicated. Patients with hemophilia should have blood samples sent for measurement of the deficient factor. Pregnant trauma patients in whom there is concern for fetomaternal blood transfer should be given Rh-immunoglobulin (RhoGAM) if they are Rh negative. Once the patient is stabilized, begin specific measures to treat the underlying cause of bleeding. The decision to transfuse depends on the rate of fall of the hemoglobin and the patient’s clinical condition. If the clinical picture is urgent, exchange transfusion, especially in vasoocclusive crisis, is the treatment of choice. This rapidly reduces the number of sickle cells while lowering blood viscosity. In patients with aplastic crisis, a decrease in the reticulocyte count indicates the need for transfusion. Long-term, gene therapy and bone marrow transplant are considered potentially curative  ; however, these treatment modalities are not widely available. Patients with thrombocytopenia who have clinical evidence of bleeding should receive a platelet transfusion. Patients with platelet counts lower than 10,000/µL are at risk for spontaneous cerebral hemorrhage and require a prophylactic transfusion. The preferred treatment for thrombotic thrombocytopenic purpura (TTP) and hemolytic-uremic syndrome (HUS) is large-volume plasmapheresis with FFP replacement. Many patients require daily plasmapheresis. Increasing platelet count, decreasing lactate dehydrogenase (LDH), and decreasing red blood cell (RBC) fragments indicate a positive response to treatment. Most patients also receive high-dose glucocorticoids as well as antiplatelet agents (aspirin). Patients who do not respond to plasmapheresis can be treated with splenectomy or immunosuppression. Immune thrombocytopenic purpura (ITP) is rarely treated with transfusion, because the transfused platelets are destroyed rapidly. In stable patients, the initial treatment is supportive care. Patients with active bleeding are treated with high-dose parenteral steroids and intravenous immunoglobulin (IVIg). Platelet transfusion is also indicated if active bleeding is present. Patients with chronic ITP who are not responsive to steroids may be candidates for immunosuppressive therapy, danazol, or splenectomy. Treatment of von Willebrand disease is with desmopressin (DDAVP), recombinant von Willebrand factor (rVWF), or von Willebrand factor/factor VIII (vWF/FVIII) concentrates. Treat hemophilia A with factor VIII concentrate. Treat hemophilia B with factor IX concentrate. The dosage is based on the site of the bleeding. Management of disseminated intravascular coagulation (DIC) focuses on treatment of the underlying disorder. Platelet transfusion may be considered in patients with DIC who are bleeding or at risk for bleeding. FFP and cryoprecipitate can be used to correct coagulation factor and fibrinogen deficiency. The role of heparin in treating DIC remains controversial and is usually used in chronic DIC, but is appropriate in patients with thrombosis. If heparin is used, it should be in conjunction with platelet transfusion. Maintain the platelet count above 50,000/µL. For hospitalized patients, surgical evaluation or hematologic consultation may be indicated. Involve a hematologist for significant cases of thrombocytopenia and hemolysis; similarly, involve a surgeon for significant trauma cases. Although controversial, transfusion of platelets may be considered in cases of immune thrombocytic purpura (ITP) or thrombotic thrombocytic purpura (TTP), even when transfusion is unlikely to be clinically useful. These situations arise with platelet counts below 10,000/µL and with life-threatening hemorrhages. In such cases, obtain emergent hematologic consultation for use of plasmapheresis, steroids, immunoglobulins, and/or fresh frozen plasma (FFP). In view of the heightened public awareness of transmissible diseases through blood and blood products, it is medicolegally prudent to discuss and document risks, benefits, and alternative treatments. When this is impossible because of altered level of consciousness, critical illness, or unavailable family, it is appropriate to document the reasons why consent could not be obtained. In the case of minors or those with religious or cultural beliefs prohibiting transfusion, involve hospital ethics and/or legal counsel when possible. Always attempt to clearly explain the risks, benefits, and alternatives to the patient and the family. Document these conversations in the medical record. In addition, involve consultants early, and document names, specialties, times and dates, and discussion topics for each consultant. Ongoing inpatient diagnostics should be based on all possible etiologies of the anemia, but a repeat hematocrit is mandatory. Consider steroids, immunoglobulins, plasmapheresis, immunosuppressive agents, and splenectomy for patients with hemolysis refractory to transfusions. Discharge may be considered in the stable patient without further evidence of hemolysis or bleeding. Check and verify that vital signs are within the reference range. The patient should be competent to make decisions and should have access to a telephone and/or transportation. The emergency physician should provide anticipatory guidance and detailed discharge instructions, including advice about what symptoms necessitate a return to the ED. Discharge instructions should recommend avoiding trauma, physical activity, alcohol, and nonsteroidal anti-inflammatory drugs and other antiplatelet agents, as pertinent. The emergency physician should also arrange follow-up with the patient’s primary physician and/or hematologist so that repeat laboratory studies and reexamination can occur in a timely fashion. Gregg SG, Mazzeo RS, Budinger TF, Brooks GA. Acute anemia increases lactate production and decreases clearance during exercise. J Appl Physiol. 1989 Aug. 67(2):756-64. [Medline]. Blanchette V, Carcao M. Intravenous immunoglobulin G and anti-D as therapeutic interventions in immune thrombocytopenic purpura. Transfus Sci. 1998 Sep. 19(3):279-88. [Medline]. Azoulay E, Knoebl P, Garnacho-Montero J, Rusinova K, Galstian G, Eggimann P, et al. Expert Statements on the Standard of Care in Critically Ill Adult Patients With Atypical Hemolytic Uremic Syndrome. Chest. 2017 Aug. 152 (2):424-434. [Medline]. [Full Text]. Shander A, Javidroozi M, Ozawa S, Hare GM. What is really dangerous: anaemia or transfusion?. Br J Anaesth. 2011 Dec. 107 Suppl 1:i41-59. [Medline]. [Full Text]. Carson JL, Stanworth SJ, Roubinian N, Fergusson DA, Triulzi D, Doree C, et al. Transfusion thresholds and other strategies for guiding allogeneic red blood cell transfusion. Cochrane Database Syst Rev. 2016 Oct 12. 10:CD002042. [Medline]. [Full Text]. Carson JL, Guyatt G, Heddle NM, Grossman BJ, Cohn CS, Fung MK, et al. Clinical Practice Guidelines From the AABB: Red Blood Cell Transfusion Thresholds and Storage. JAMA. 2016 Nov 15. 316 (19):2025-2035. [Medline]. [Full Text]. Centers for Disease Control and Prevention. Blood Safety: Diseases and Organisms. CDC. Available at http://www.cdc.gov/bloodsafety/bbp/diseases-organisms.html. March 14, 2013; Accessed: July 15, 2015. Graham K, Moon-Massat PF, Unger EC. 2017 Military Supplement: Dodecafluoropentane Emulsion (Ddfpe) as a Resuscitation Fluid for Treatment of Hemorrhagic Shock and Traumatic Brain Injury: A Review. Shock. 2017 Nov 15. [Medline]. Alayash AI, D'Agnillo F, Buehler PW. First-generation blood substitutes: what have we learned? Biochemical and physiological perspectives. Expert Opin Biol Ther. 2007 May. 7(5):665-75. [Medline]. Tsai AG, Salazar Vázquez BY, Cabrales P, Kistler EB, Tartakovsky DM, Subramaniam S, et al. Replacing the Transfusion of 1-2 Units of Blood with Plasma Expanders that Increase Oxygen Delivery Capacity: Evidence from Experimental Studies. J Funct Biomater. 2014 Oct 27. 5 (4):232-45. [Medline]. Haruki R, Kimura T, Iwasaki H, Yamada K, Kamiyama I, Kohno M, et al. Safety Evaluation of Hemoglobin-Albumin Cluster "HemoAct" as a Red Blood Cell Substitute. Sci Rep. 2015 Jul 29. 5:12778. [Medline]. [Full Text]. Koren A, Segal-Kupershmit D, Zalman L, et al. Effect of hydroxyurea in sickle cell anemia: a clinical trial in children and teenagers with severe sickle cell anemia and sickle cell beta-thalassemia. Pediatr Hematol Oncol. 1999 May-Jun. 16(3):221-32. [Medline]. Krishnamurti L, Bunn HF, Williams AM, Tolar J. Hematopoietic cell transplantation for hemoglobinopathies. Curr Probl Pediatr Adolesc Health Care. 2008 Jan. 38(1):6-18. [Medline]. Walle JV, Delmas Y, Ardissino G, Wang J, Kincaid JF, Haller H. Improved renal recovery in patients with atypical hemolytic uremic syndrome following rapid initiation of eculizumab treatment. J Nephrol. 2017 Feb. 30 (1):127-134. [Medline]. [Full Text]. Nakao H, Ishiguro A, Ikoma N, Nishi K, Su C, Nakadate H, et al. Acquired idiopathic thrombotic thrombocytopenic purpura successfully treated with intravenous immunoglobulin and glucocorticoid: A case report. Medicine (Baltimore). 2017 Apr. 96 (14):e6547. [Medline]. [Full Text]. The authors and editors of Medscape Reference gratefully acknowledge the contributions of previous author Craig N van Roekens, MD, MBA, MPH, FACEP, to the development and writing of the source article.